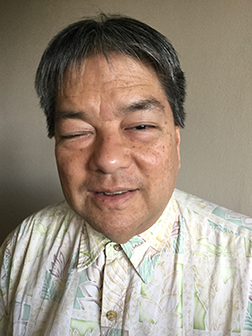 From the Editor: Curtis is the retired president of the NFB in Computer Science, having given up that title in the summer of 2016. He now serves as the organization's treasurer. In addition he serves as the treasurer for the NFB of New Mexico, taking on that job in January of 2014. For pay, Curtis works as the manager of assistive technology at the New Mexico Commission for the Blind, where he continues to push for nonvisual access in education, recreation, and employment. While attending the 2017 convention of the National Federation of the Blind in Orlando, Florida, I was among the lucky handful of individuals who was able to buy (for $449) the Orbit Reader 20. For the first time I was able to own a refreshable Braille display which cost under $500. Every other piece of refreshable Braille technology that I have ever used was paid for either by my employer or a rehabilitation agency and cost thousands of dollars. You might say that I felt as if I had scored a personal victory here. The opinions expressed in this article are mine and mine alone, and the needs I have with respect to refreshable Braille technology may or may not be reflective of the blind community as a whole. I have four specific requirements for refreshable Braille. First, I want a device that I can use to quickly write and edit long and detailed notes during a meeting and (perhaps more important) allow me to read them back while talking or presenting at that meeting. My second requirement for refreshable Braille is that, from time to time, I want to be able to connect the device to my computer so that I can proofread a document on the computer in greater detail than I can using speech alone. My third requirement is to be able to read in Braille agendas and other documents that I have copied from a computer. Lastly, I want to be able to read Braille books that I have downloaded from various sources of electronic Braille. I do not want or need a Braille device to search the web, produce professional-looking documents, edit an article, send and receive email, or read information on my iPhone. In other words, I want my refreshable Braille technology to supplement—not replace—my computer or iPhone. What Is the Orbit Reader 20? serving as a refreshable Braille display (by connecting via Bluetooth or USB) for a computer, smart phone, or tablet running a screen reading program. In addition to the twenty-eight-dot Braille cells, the Orbit Reader 20 also has a Braille keyboard, a cursor pad, and rocker keys to move through a document or book. The Orbit Reader 20 does not have the traditional cursor routing buttons that many people have come to expect in more expensive refreshable Braille devices. It reads from and stores information on an SD (Secure Digital™) card, which can be up to thirty-two gigabytes in size. It supports USB and Bluetooth connections. The Braille cells themselves produce dots that are locked in place, meaning that the Braille feels as solid as a Braille sign—no more dots going down when you push them. If you think of the Orbit Reader 20 as an electronic slate and stylus, you will understand what I mean when I say that the Orbit Reader provides no forward or backward Braille translation. Information stored in contracted Braille is displayed in contracted Braille, and information stored as plain, readable ASCII text will be displayed in what is called Computer Braille, which is the code that drives Braille displays and embossers. Any notes you write will be stored exactly as you wrote them. Slate and stylus users (a diminishing population, I know) are familiar with the crazy Braille contractions and codes we use to jot down information in a hurry. While these codes may make no sense to other people, they certainly make sense to us. The really nice thing about the Orbit Reader 20 is that if we use these codes to speed up our writing, we can read them back. For me, this is an extremely valuable feature. If you want to copy a Word document to the Orbit Reader 20, you need to run the document through a free "Send to Braille" program, which is a shortcut that adds Braille to the Windows® Send To menu, which converts files on your computer into the unformatted BRL (Braille Ready Format). You can check out this free software using the link http://tech.aph.org/lt/. The Orbit Reader 20 is by far the least expensive twenty-cell Braille display. Yes, it does lack certain functions, but in order to get those functions, you have to spend a lot more. For purposes of comparison, consider that the VarioUltra 20 (a twenty-cell display from Baum) costs $2,395, and the Braille Edge, a forty-cell display from HIMS, costs $2,795. The Orbit Reader 20 cost me $449. The Orbit Reader 20 fits easily into a briefcase. This means that when I need it, I have it. Other displays I have tried were either too large or too fragile to be safely stored in my cramped case, and I could not afford the $2,395 that I would have had to spend to acquire the VarioUltra 20. The Braille dots on the Orbit Reader 20 are locked in place when raised. They do not give when pressed. Once mastered, the Orbit Reader 20 is very easy to use, and it takes only a few seconds to turn it on from the power off state. During a long note-taking session, you can suspend the unit to conserve battery. The Orbit Reader 20 is supported by all of the current screen reading programs used by the blind: VoiceOver, NVDA, JAWS for Windows, and System Access. Remember that once you connect the Orbit Reader 20 to your screen reader, any functionality you experience is provided by the screen reader—not the Orbit Reader 20. As of this writing, the Orbit Reader 20 is not yet ready to be sold to the general market. There simply aren't enough units to go around. However, the supply issues are being addressed, to the point where suppliers are now declaring that the Orbit Reader 20 is coming soon. And as far as I know, the price appears to be set at $449. The Orbit Reader 20 does not refresh as quickly as more expensive displays. Some people will regard this as a negative. Others, like me, will not. Also, there is a certain amount of noise when the Braille cells are refreshed, but I have not yet found this to be a problem when I use the Orbit Reader 20 in meetings. The lack of cursor routing buttons has been criticized, but learning how to move the cursor around on the twenty-cell display will mitigate this problem. Once I learned how to do this, I found that the lack of routing buttons was not significant. At least, I did not find their absence to seriously impede my work. The Orbit Reader 20, being of a rather simplistic design, does not teach itself. You can't simply press keys and hope to figure out how to make it work. This was my experience. There is no help built-in, and there is certainly no context-sensitive help available. You really do have to give some attention to the manual. When you purchase the unit, a Braille version of the manual is available to read off of the SD card, and the most current version of the manual is available online at http://www.orbitresearch.com/support/orbit-reader-20-support/orbit-reader-20-user-guide-downloads/. Finally, a computer running Windows is required to update the Orbit Reader 20 firmware. This could be a problem for people who want to update their Orbit Reader 20 firmware but who don't have a Windows computer available to them. It is unfortunate that the Orbit Reader 20 has been actively promoted for a year-and-a-half with no reliable supply yet available for purchase. Unless or until this major problem is solved, I fear that the initial enthusiasm with which this technology was greeted will wear off, to the point where people will simply spend more money to obtain other Braille devices. I sincerely hope that this does not happen and that we will see Orbit Reader 20's flying off the shelves. Is the Orbit Reader 20 going to be useful to every blind person who needs or wants a less expensive refreshable Braille display? There is no simple answer to this question. Refreshable Braille purists, familiar with more expensive devices, will doubtless complain about the slow refresh rate, the noise of the refreshing dots, and the lack of cursor routing buttons. Others will decry the lack of forward or reverse Braille translation, and some users who are not technology enthusiasts will not be happy about having to read the user guide. As I understand it, a great deal of money has already been spent by a number of organizations to bring a low-cost Braille display to the blind community around the world. This is an exciting time for Braille users. Let us move forward with the expectation that before the end of this year, we will be able to purchase the Orbit Reader 20 because there will be enough for those who want them. The Orbit Reader 20 was designed in accordance with the specifications developed by the Transforming Braille Group, a consortium of the world’s prominent organizations of the blind. The overarching objective was to create a low cost, simple to use, and compact refreshable Braille display that would be affordable for students in developing countries and at the same time provide functionality and quality that are appealing to users in developed countries. To achieve the goal of affordability, careful consideration was given to the cost implications of various features; and tradeoffs were made on features such as cursor routing buttons, refresh speed, and sound during refresh. Extensive field testing was performed with users around the world, which confirmed that these tradeoffs would not affect usability. In addition to providing the key features of book-reading, note-taking, and connectivity to screen readers, the Orbit Reader 20 brings unique signage-quality Braille, which is especially helpful to beginning Braille readers. As with any groundbreaking technology, there were numerous technical challenges in getting the manufacturing streamlined, which resulted in a slower release to the market. We are pleased to note that we have worked through these challenges and are now in the process of accelerating production. We look forward to the Orbit Reader 20 and its breakthrough technology bringing affordable electronic Braille to millions of blind people around the world.